Allen M. VanSant, Inc., (AVS Plumbing & Heating) has served Howard County and Carroll County in Maryland since the 1950’s. As a family owned and operated business, we take great pride in the care and expertise that we put into each job. From small repairs to major replacements, you can trust that the professionals at AVS Plumbing & Heating will get the job done right. Since 1954, AVS Plumbing & Heating has served customers throughout Howard and Carroll Counties in Maryland from our West Friendship, MD headquarters. We are a family owned and operated company employing only the highest trained plumbing and heating professionals. AVS Plumbing & Heating works hard to achieve complete customer satisfaction. Our dedicated team – from the front office to our field technicians – is here to take good care of your home and provide a hassle-free experience. AVS Plumbing & Heating strives to make your experience with us a positive one. We know that in many cases, you have chosen us to solve a problem. Whether it’s emergency service for a leak, or general plumbing repairs or replacements, our job is to do the work right the first time. Our technicians are courteous and will be respectful of the cleanliness of your home. AVS Plumbing & Heating is a licensed plumbing and heating contractor in Maryland. Unlike contractors who do unpermitted, unlicensed work, we take pride in being a reputable firm. We will work with the County to pull any necessary permits and have our work inspected. The end result is a job well done, and done to code. Did you know that if a worker is injured on the job at your home, you may be held liable if your contractor is uninsured? While hiring an uninsured contractor may be cheaper, the risk of both injury and shoddy workmanship is not worth the pennies saved. AVS Plumbing & Heating gives you peace of mind in knowing that your job has been done by professionals. Not all plumbing products are created equal. Even well-known brand names can offer products that do not meet our high standards. AVS Plumbing & Heating takes time to learn about the products we install before we install them. Our teams attend industry conventions and are trained in installing a wide variety of plumbing and heating products. Michael J. Kastner Jr. is a registered, licensed Master Plumber MD #1862, Howard County #1862, Carroll County #P00112MG, WSSD #287, Frederick County #PM00217, Anne Arundel County #A200437, Baltimore County #MP596 and Baltimore City #M010150. In order to continuously improve our business, we welcome your feedback. And in today’s review-based world, your feedback counts event more. Feel free to either contact us directly with your feedback, or share your experience with us on Google, Facebook, or Yelp. Links are located below for your convenience. 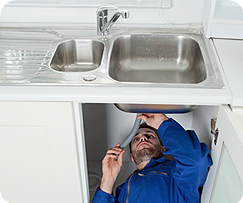 From emergency service to remodeling, we know plumbing! Service and installation for water heaters and boilers. Well and pump service, maintenance and installation. Learn how to make your home more energy efficient. Save money on hot water costs with these helpful tips.